The composite outer layer of UltraSlick« Transfer Boards produces a constant slick surface that requires no waxing and never needs refinishing. 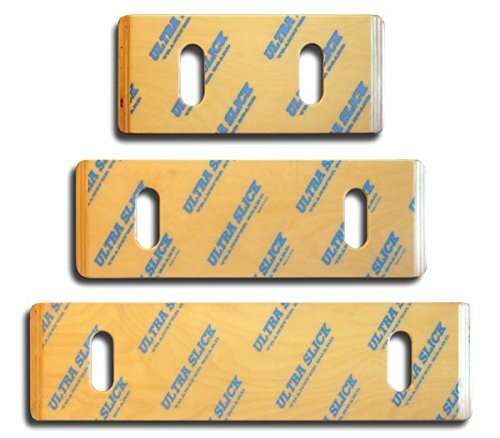 The plastic surface over layers of select hardwood increase strength so the boards are thin (7/16 inch) and very lightweight. A lacquered finish on the back allows for easy placement, while reducing movement of the boards during transfers. "Using this board, we have been able to teach high Quads to transfer independently. Prior to using the UltraSlick«, these patients required help to transfer." - Kathy Dunn, rehabilitation clinical specialist. "The UltraSlick« is also helpful in wet transfers." - Kathy Roy, Director of Spinal Cord Physical Therapy, VAMC San Diego. The UltraSlick Transfer Boards are available in 18, 24, 27 and 30 inch lengths.UltraSlick Transfer Boards Features:Provide maximum strength with minimum weight.Technologically advanced composite surface dramatically reduces effort required to transfer.Very light weight and maneuverable.UltraSlick Transfer Boards Specifications:Weight limit: 250 lbs.Board width: 8 inches.Choose length: 18, 24, 27 or 30 inches.Made in: U.S.A. If you have any questions about this product by Composite Medical Distributors, contact us by completing and submitting the form below. If you are looking for a specif part number, please include it with your message.